Okay so now I am apparently addicted to the Dollar Tree and Dollar Store. It's amazing the things that you can find to craft with or to repurpose, and on the cheap (which is the best part). I adore crafts created using vintage book pages, but for me I can't bring myself to rip a page out of a vintage book. My solution is the $1.00 book section at Dollar Tree. So I have several books sitting on my craft table, aka the previously known formal dinning room table, and came-up with the idea to create chic little Halloween party favor or treat bags using book pages! 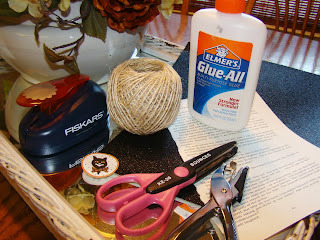 Supplies - 3 book pages, black glitter card stock, paper, just twine and glue, and two hole punches. The adorable retro Halloween images I found, of course on the The Graphics Fairy blog, I copied the images and set them on different backgrounds using my basic word program, and punched those out with my 1 1/2" punch, and set on scalloped edged black glittered card stock punches. Creating the little bags was super simple by tearing out the pages, creating a clean edge and then folding over and gluing! After they were dry I used a fancy scissors to cut a large scalloped edge on the top of each bag. I then punched a hole at the top of each bag and affixed each little tag with jute twine. My bags came out measuring 4 1/4" x 3". I'm like you and hate tearing pages out of good books. Your Dollar Store idea is genious. Cute bags, too. So very cute! Such a fun idea! these are adorable! I plan on trying to make them! These are so adorable! I would love to feature them on Reduce, Reuse, Upcycle. Feel free to stop by and grab a featured button. Thanks! Thinking these would be cute using children's books from the Goodwill. These are fantastic. I am absolutely in agreement about tearing up vintage books. It makes my heart go flip flop when I see wonderful old books torn up - but this is a brilliant solution! Very cute and fun. Perfect for school parties. Love it! Just found you on Pinterest! What a super idea! Our library has a shop where they sell gently used books for like a quarter! I am going to buy some and use these bags for our book club meeting favors! So glad you stopped by! They would be so cute for your book club! These are adorable! The Dollar Store is one of my favorite places to shop. 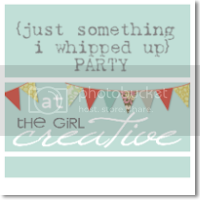 I'd love for you to link up at my craft party!